In order to let Jammuities get rid of the menace of fleecing auto-rickshaw drivers, time and again, we have shared valuable information on the existing auto-rickshaw fares set up by J&K Motor Vehicle Department. Although metro cities are way ahead for providing a glide path to commuters with multiple options like Uber, Ola etc., J&K is still stuck with the installation of meters in auto-rickshaws. And the shadow for all this outdated work mechanism falls squarely on Traffic Police and J&K Motor Vehicle Department. The authorities need to adopt stringent policies to bring some change on the ground. In December 2018, Motor Vehicles Department Jammu initiated a special drive against Auto Rickshaws drivers for the implementation of the meters and charging as per meters. Also, fare charts of the important origination/destination points of Jammu city were publicized by RTO Jammu but considering the present situation, all the effort seemed to be of no use. RTO Jammu had appealed to the general public and commuters to pay the auto-rickshaw charges as per meters or fare chart. He also warned the vehicle operators to strictly adhere to the provisions of the MV Act, 1988 and rules framed there under, failing which they were warned to be booked under the relevant provisions of the Law. The fares haven't changed since last year yet most of the autorickshaws charge at will from people. Auto-drivers in Jammu seldom follows the meter system so you end up paying Rs 150 to Rs 200 to cover a distance of 3 to 5 km. Most of you would be surprised to know that the actual fare for the first two kilometers is capped at Rs. 33 and for the subsequent kilometers; you have to pay around Rs.14 per kilometer. In case you are making the auto to wait, it will cost you around Rs. 25 per hour with no charges for the luggage up to 25 kgs. As per the revised fares, a person has to pay around Rs. 69 from Jammu airport to Asia Hotel for a distance of 4.50 kilometers. It is saddening that because of the unawareness, passengers suffer badly as the drivers charge around 200-300 bucks alone to drop you to Jewel Chowk from the Railway Station. You just have to pay Rs. 104 from Jammu Airport to Trikuta Nagar and just Rs. 57 to reach Gandhi Nagar. Deputy Controller, Consumer Protection Jammu Manoj Prabhakar said, "A collaborative drive was started in December 2018 by Department of Legal Metrology J&K, J&K Motor Vehicles Department and J&K Traffic Police to tighten the noose around auto-rickshaw drivers and prosecuting them to make them get online." He further said, "More than 1700 new meters have been recalibrated including Katra and Udhampur region within two months. The department is catching hold of violators and most of the autorickshaws have meters but we are making them functional and pasting stickers on the vehicle for people"
He added that the department is compiling the data of the autorickshaw drivers following all guidelines and using meters in order to reward them. He believes that success can be achieved only when there is mutual cooperation between concerned government departments and the general public. 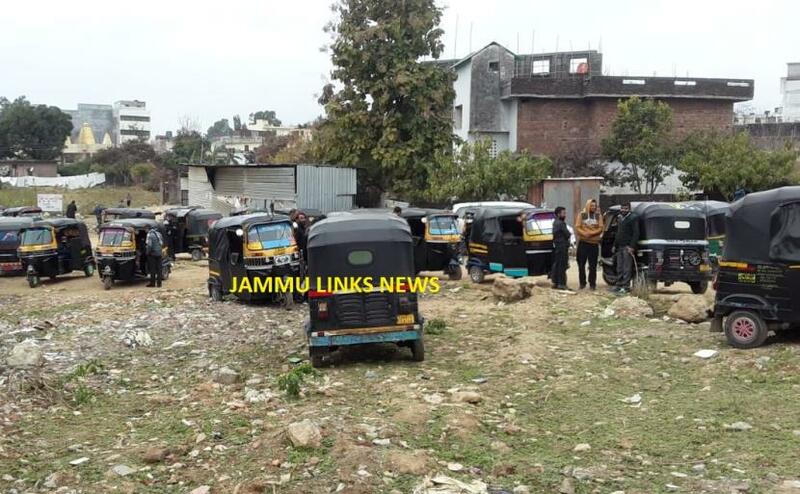 On asking about the number of auto-rickshaw permits given in Jammu city, Regional Transport Officer (RTO) Jammu Deep Raj Kanethia said, "There are around 3500 autorickshaws plying on the roads and most of them already had meters but they never followed guidelines. We are taking stringent actions to challan the violators and also planning to organize awareness drives in the coming week or so." He added that the violators are challaned regularly to help them get an insight into the working of the system. He further ensured that the system will be much more transparent with the passage of time but this whole process will take time. But while talking to a few auto drivers, we realized that despite such stringent policies, they don't seem to abide by the rules. The general public has to shell out a lot of money on autorickshaw fare because the auto drivers do not agree with the fare list decided by the department. on enquiring, we found that drivers feel that the following rate list earns them nothing besides due to the lack of commuters, they have to suffer at the end. "If we will go by the rate list, still there will be a hue and cry by the people. We hardly earn to make ends meet due to fuel costs and dearth in commuters on certain routes," said Amarjeet, an auto driver for the past ten years. "They keep on charging as per their wishes and always refuse to go by the meter. Moreover, there are times when at night they charge double simply because they claim that they would not get any other passengers on their way back," Kamla Devi, a commuter by autos said. Around Gandhi Nagar hospital, there is an auto-stand right outside the gate. Usually, patients and their relatives who are much likely to hire these autos have to bear the brunt owing to their struggle to indulge in hard bargains. So, a word of caution for everyone who hires an auto every now and then, kindly read the instructions pasted on rickshaws and immediately contact the Traffic department in case the situation escalates.